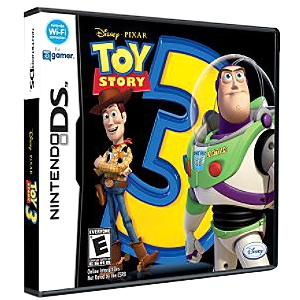 In the Toy Story 3: The video game help Buzz, woody and the rest of the toys ensure no toy gets left behind, or experience all new imaginative adventures. No toy gets left behind as you run, ride, and fly through scenes from Toy Story 3! And as the toys journey through the real world, they come up with unique ways to escape hazardous situations. Join these fantastic adventures to stop a speeding train, battle enemies in space, race downhill in an out-of-control wagon and much more! Find out what happens when Andy's away and toys decide to have some playtime! Combine all the toys on awesome location-themed play mats such as the Old West, a prehistoric world, an alien planet and more! Play as either Woody or Buzz and defend your home base against loads of fun and zany enemies.